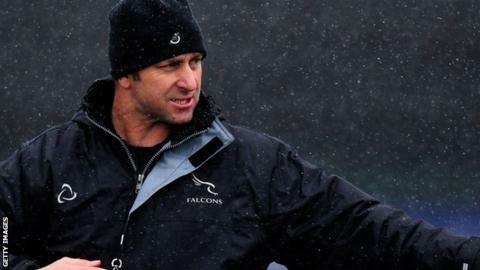 Newcastle Falcons have announced that head coach Peter Russell is to leave the club at the end of the season for personal reasons. Russell arrived at Kingston Park in the summer of 2012 from Hawke's Bay and in his first season the Falcons sealed promotion back to the top flight. "I have thoroughly enjoyed my two years with Newcastle Falcons," said Russell. "The Falcons supporters have been very welcoming and warm towards me during my time here and I am grateful for that." Newcastle director of rugby Dean Richards added: "Peter will be a huge loss to the squad. In my years of being involved in the game I've never come across anyone with such an in-depth understanding of the game and an appetite for learning like Peter's. "He is liked and admired by all. We will be wishing him all the best at the final whistle of the season but, as Peter keeps saying, there are games to be played, which means more games to be won."